If you are looking for a unique gift for a child than Tolalu is the place to check out. I know when I was a kid it was always hard to find items with my name on it and forty years ago they didn’t have as much personalization as they do now. So if you have a child with a unique spelling name, they can still have their very own items. Tolalu stands for beautifully designed, high quality products. We wanted to make it simple for parents to buy well designed products with a personal touch – as a present for your own kids or as a present to other kids you love and want to pamper. All of our products were made with love and special attention to detail. When we make a new design we first send it to the kids around us to get their feedback. Only after getting their approval do we start offering the products to our costumers. The toughest part of this review was choosing what product I was going to get. 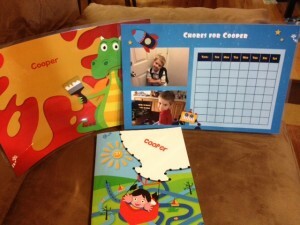 I choose and activity book, chore calendar, and place-mat. I really love the activity book. There are so many different puzzles from mazes to connect the dots. I have to stop Cooper from finishing them all in one night. The place-mat is nice for me, less mess and he knows exactly where he is sitting. Let’s talk chore chart. I am over the moon happy about this item. Cooper is six but also has ADHD so visuals are so good. I tell him for each chore I ask him to do I will give him $1. He is always asking me how much he has earned. So with the chore chart there is plenty of room to put the chore plus how much he has earned. He reminds me daily to put his money on there. Love him. Your next birthday party give the kiddos a personalized gift with Tolau. Disclosure: I received Tolalu products in exchange for a post about the personalized gifts for kids. All thoughts and opinions are my own.